"These musicians have a knack for connecting with new compositions that send a clear message of sound and mood that any listener can relate to. [The disc] ranges from a sampling of Beethoven's Scottish Folk Songs, Op. 108, to Poulenc's Le Bestiaire, to four scenes from Ellis Portal, a powerfully evocative portrait of Toronto drawn in words by Rex Deverell and set to music by Andrew Ager. Also very moving are a new setting of In Flanders Fields by young local composer Stephanie Moore, and the atmospheric Tenebrae by Argentinean composer Osvaldo Golijov." "An eclectic program of vocal gems . . . A particular coup is the world premiere recording of Argentine-American composer Osvaldo Golijov's haunting Tenebrae. . . . A very successful debut recording for this Toronto ensemble." 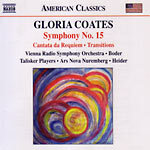 Our live performance (from November 2005) of Cantata da Requiem by Gloria Coates is included on this recent Naxos release of Coates's work, on the America Classics series. It has been widely praised by critics in Europe and North America. Also includes: Symphony No. 15, Homage to Mozart (Vienna Radio Symphony Orchestra, Michael Boder conducting) and Transitions (Ars Nova Ensemble Nuremburg, Werner Heider conducting). Available at L'Atelier Grigorian stores, and also online at www.grigorian.com, www.naxos.com, and other websites. "But the real gem on this disc is the Cantata da Requiem, a magnificent chamber setting of World War II-era poetry from England and Germany done with a similar mixture of sentiment and terror. 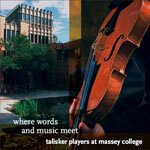 Soprano Teri Dunn is the eloquent soloist with the Talisker Players."